Light curtains for elevator door edges have been the established technology for protecting passengers from door impacts for many years. Their usage is described in the relevant codes in many regions and some basic light curtains can meet the standards. However, there are technologies available in the market which enhance passenger safety and can significantly reduce the risk of damage due to door strikes. There are many positive outcomes, for example; greater availability of the elevator, less breakdown interventions, and a reduced liability for the equipment owners. The majority of light curtains provide a two-dimensional detection zone. This means that detection is only possible once an object is between the elevator door edges. A three-dimensional detection zone can detect outward into the corridor. This provides earlier signals to lift doors on the approach of an object therefore increasing elevator safety and reducing potential impact on doors. Some devices use an additional sensor to create the 3D detection which is often mounted in the transom and this increases fitting time. Light curtains where the 3D detection is created by the light curtain itself without the need for a third sensor are the most convenient to fit. There is the added benefit of ensuring that the 3D projection is related to the door separation. As the doors come closer together 3D detection zone is reduced relative to the risk of door strike and usually disabled completely for the last 20cm or so of door closing. 3D detectors offer potential benefits in many installations but are particularly relevant in high-traffic public areas; where passengers may be running to catch the lift, queuing to enter the lift car or wheeling large objects such as trolleys. At Avire we have gone a step further to supplement the protection offered by conventional elevator safety devices by installing coloured LED’s throughout the length of each light curtain. 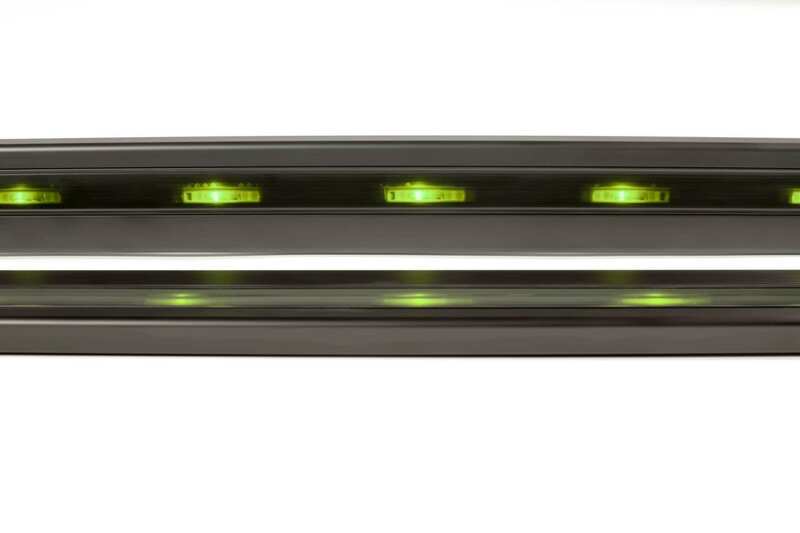 When installed dynamically (fitted to the car doors), these lights are visible as strips along the moving leading edge of each lift door. In normal operation, the LEDs flash green while the doors are opening, are solid green while the doors are wide open and flash red while the doors are closing. The original intention of Panachrome’s design was to enhance safety for the visually, or mobility-impaired. The visibility of the lit door edge enhances elevator safety by making it easier for passengers to determine its current status. The visual cues can also be enhanced with audible voice cues. “Talking doors” that warn of closing doors are powered by built-in devices called voice annunciators. Visual and audible cues, combined with 3D detection, reduce the chances of door damage, which is critically important where slow, heavy, or large objects are frequently entering lift cars. Examples include beds being pushed into hospital lifts, shopping carts in mall elevators, and baggage carts in airports or hotel lifts. In these circumstances obvious indications of door-edge movement give advance warnings of lift doors closing, and may increase the time a passenger has to react and avoid an impact from closing elevator doors. Visit our website Panachrome+ page to learn more about LEDs and door-edge safety. Tom Davies is the Sales Director for Avire, a leading provider of safety and communication equipment for the lift industry, and including the leading brands of Memco, E-Motive, Janus, Microkey and TL Jones. Tom can be contacted via LinkedIn or please fill out a contact form.